Social problems associated with structural unemployment. Although the rust belt refers mostly to the mid-west of the US, it can refer to any area which experienced a decline in heavy manufacturing industry around the 1980s. For example, in the UK, the 1980s also saw a declining manufacturing sector in north-east England, south Wales and parts of Scotland. Pennsylvania, West Virginia, Ohio, Indiana, and the Lower Peninsula of Michigan, ending in northern Illinois, eastern Iowa, and southeastern Wisconsin. What caused the area to become a rust belt? Shift in comparative advantage. With rising real wages in the post-war period, labour intensive manufacturing industries became less competitive compared to new industrial nations in Asia. Textile industries were in difficulty well before the 1970s. The decline in manufacturing is mirrored in other western nations, such as the UK. The US economy saw a decline in manufacturing as a share of GDP, but rise in services. Shift within the US. Whilst the rust-belt lost jobs, some US manufacturing jobs shifted to the south. One reason for this shift within the US was comparative labour costs. In the north-west, wages tended to be higher. This is partly due to greater trade union presence, and greater availability of migrant labour in the south. It is worth bearing in mind that Germany and Japan both had strong exchange rates but did not see the same decline in manufacturing. The strong dollar exacerbated underlying issues of lack of competitiveness. Negative regional multiplier effect. When large steel or coal plants close down, it causes knock-on effects to the rest of the local economy. WIth a rise in unemployment, there is a fall in demand for local services – transporting, food, entertainment. Many local jobs were indirectly related to the big manufacturing employers. WIth falling incomes, rising unemployment and pessimism over prospects, local people often left these towns to seek employment elsewhere. However, this flight of young, skilled workers caused the negative regional multiplier effect to magnify. Social problems. The decline in manufacturing and a rise in structural unemployment corresponded with rising social problems, such as drug use and higher crime rates. This further made areas less attractive giving more reasons for people to leave. Local finances. The decline in jobs and industry also hit local government finances. With falling incomes and sales, local tax receipts fell – giving less income for states to invest in building new infrastructure. 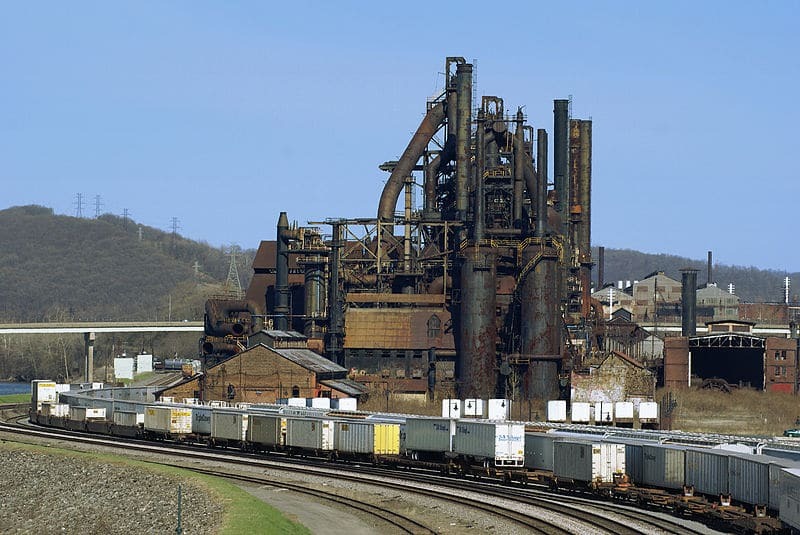 What role did globalisation play in creating the rust-belt? Some economists argue that free trade and globalisation speeds up the process of ‘creative destruction’ – Firms find it easier to shift production around the world to areas with lower labour costs and more competitive. During the decline of US manufacturing, there was an increase in imports from China and Japan leading to lower domestic demand. The US consumer found cheaper alternatives to US manufactured goods. Globalisation also led to increased capital flows in US capital markets (stock markets, government bonds) This benefited the US service sector, but contributed to higher dollar and less competitive US industries.